thermalBC(thermalmodel,RegionType,RegionID,'Temperature',Tval) adds a temperature boundary condition to thermalmodel. The boundary condition applies to regions of type RegionType with ID numbers in RegionID. thermalBC(thermalmodel,RegionType,RegionID,'HeatFlux,HFval) adds a heat flux boundary condition to thermalmodel. The boundary condition applies to regions of type RegionType with ID numbers in RegionID. Use thermalBC with the HeatFlux parameter to specify a heat flux to or from an external source. To specify internal heat generation, that is, heat sources that belong to the geometry of the model, use internalHeatSource. thermalBC(thermalmodel,RegionType,RegionID,'ConvectionCoefficient',CCval,'AmbientTemperature',ATval) adds a convection boundary condition to thermalmodel. The boundary condition applies to regions of type RegionType with ID numbers in RegionID. thermalBC(thermalmodel,RegionType,RegionID,'Emissivity',REval,'AmbientTemperature',ATval) adds a radiation boundary condition to thermalmodel. The boundary condition applies to regions of type RegionType with ID numbers in RegionID. thermalBC = thermalBC(___) returns the thermal boundary condition object. Apply temperature boundary condition on two edges of a square. Apply heat flux boundary condition on two faces of a block. Apply convection boundary condition on four faces of a block. Apply radiation boundary condition on four faces of a block. Use function handles to specify thermal boundary conditions that depend on coordinates. Assume that there is a heat source at the left end of the rod and a fixed temperature at the right end. The outer surface of the rod exchanges heat with the environment due to convection. Define the boundary conditions for the model. The edge at y = 0 (edge 1) is along the axis of symmetry. No heat is transferred in the direction normal to this edge. This boundary is modeled as an insulated boundary, by default. The temperature at the right end of the rod (edge 2) is a fixed temperature, T = 100 C. Specify the boundary condition for edge 2 as follows. 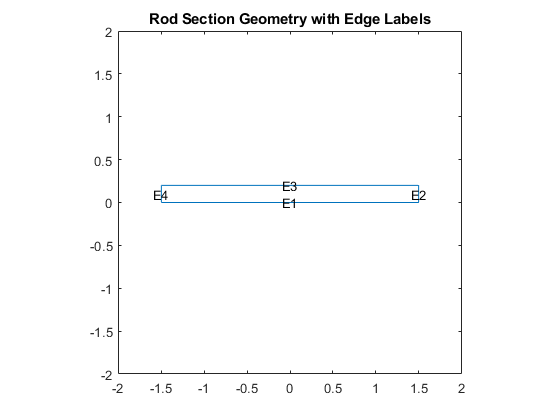 The convection coefficient for the outer surface of the rod (edge 3) depends on the y-coordinate, 50y. Specify the boundary condition for this edge as follows. The heat flux at the left end of the rod (edge 4) is also a function of the y-coordinate, 5000y. Specify the boundary condition for this edge as follows. Geometric region type, specified as 'Edge' or 'Face'. The solver passes location data as a structure array with the fields location.x, location.y, and, for 3-D problems, location.z. The state data is a structure array with the fields state.u, state.ux, state.uy, state.uz (for 3-D problems), and state.time (for transient problems). The state.u field contains the solution vector. The state.ux, state.uy, state.uz fields are estimates of the solution’s partial derivatives at the corresponding points of the location structure. The state.time field contains time at evaluation points. Tfun must return a row vector Tval with the number of columns equal to the number of evaluation points, M = length(location.x). HFfun must return a row vector HFval with the number of columns equal to the number of evaluation points, M = length(location.x). CCfun must return a row vector CCval with the number of columns equal to the number of evaluation points, M = length(location.x). Specify ambient temperature using the AmbientTemperature argument. The value of ConvectionCoefficient is positive for heat convection into the ambient environment. REfun must return a row vector REval with the number of columns equal to the number of evaluation points, M = length(location.x). Specify ambient temperature using the AmbientTemperature argument and the Stefan-Boltzmann constant using the thermal model properties. The value of Emissivity is positive for heat radiation into the ambient environment. Ambient temperature, specified as a number. The ambient temperature value is required for specifying convection and radiation boundary conditions. Handle to thermal boundary condition, returned as an object. thermalBC associates the thermal boundary condition with the geometric region.